How did Julianne Moore, who excels in dag…. 73rd ANNUAL GOLDEN GLOBE AWARDS — Pictured: (l-r) arrive to the 73rd Annual Golden Globe Awards held at the Beverly Hilton Hotel on January 10, 2016. How many canaries died to dress Jennifer Lopez? ..and does Angelina want her leg back? Although those shoes are worth showing off. 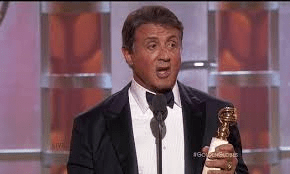 Why does Sylvester Stallone look so much like Dean Martin these days? I remember reading somewhere that a military drone’s targeting system will get confused by bright yellow. So I am assuming that Lopez is a CIA operative; deep, deep, under cover. Not deep enough though SPK.....that dress should be deep, deep underground. In a vault. Cemented in.